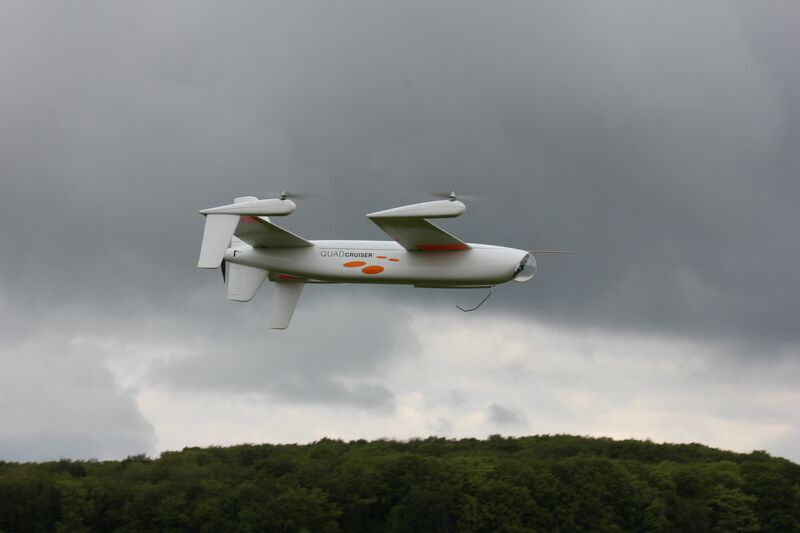 As a project partner of Airbus Innovations Manching SFL was a leading member of the development team of this future remotely piloted aircraft system. The unique selling point of this RPAS is the synthesis of VTOL and economic and fast cruising flight capability and/or long endurance. These are performance features which a conventional helicopter or quadrocopter could not fulfill. Take off and landing are performed in the quadrocopter modus. The four lift off propellers are driven by electric motors. During cruising flight they are inoperative and aligned in flight direction. As primary propulsion device then worked a pusher electric engine in the rear. A Proof of Concept Prototyp with a take off mass of 12 kg serves for flight testing. The support of SFL comprises contributions to conceptual design, flight mechanics and performance calculations and also construction of prototype and integration of systems. The versatile experience of SFL in the field of electric flight in that case is very useful. Also in flight testing SFL has been involved. The first flights had been conducted in December 2013. Further development activities are conceptual design and construction of a larger prototype with higher payload and the development of a hybrid propulsion system for long endurance and range. SFL as well with its partners of Airbus, the Institut of Aircraft Designis of the University Stuttgart, and further partners are involved in the national Aerospace research programme (LUFO). The topic is hybrid propulsion for RPAS. The missions of those RPAS are observation and transport tasks where take off and landings in overcrowded areas and impassable terrain are required.